Chance of "Fear of the Yeti - Attack Damage Lowered!" Lowers the Enemy's Attack Damage to -50, then -40, then -30. Description: Yeti's from the Northern regions of Planet Thoh favor this powerful claw attack. "Frozen Circuits x1.5 Damage Over Time!" The Opponent takes DoT damage, which the power of the Damage over Time is multiplied by 1.5. Description: A powerful ice cannon meticulously designed by Yeti engineers! High Chance of "Pulse Multiplier! Extra Shot!" Does an additional shot for 100% full damage. "Critical Chance Increased by X%!" Description: Whats more frightening than a yeti? 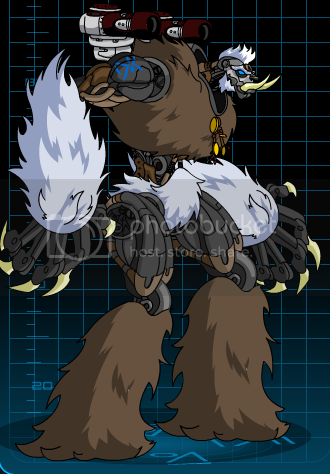 How about a yeti with lasers on its shoulders? Chance of "Disorientation! -40 Attack Bonus!" to activate on crit, lowering the opponent's Bonus by 40. Chance of "Pine Solid! + X% Damage! ", increases hit's damage by X%, where X is a number between 40 and 70. Description: When bullets and missiles aren't enough ... try trees! "Yeti Focus", decreases the enemy's Boost by 20 and increases your Boost by 40. Description: Stare into the face of a stone cold yeti!